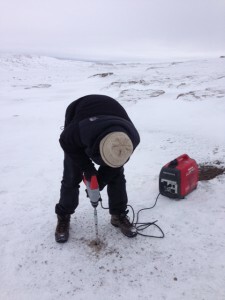 The Icebreaker project team deployed from Resolute to Haughton Crater on Devon Island on August 12, catching the last remnants of favorable Arctic weather in time to set up our test site at Drill Hill in the crater. A good thing, as the weather immediately worsened… ten days of below-freezing temperatures, high winds and snowfall followed. It was in some respects more logistically challenging than the University Valley tests with a different drill, last January in Antarctica (see earlier Mission:Ames posts). Our NASA-Honeybee Robotics team persevered, despite snow drifts that made it difficult on quads to reach the test site, and icing that periodically brought down communications. We tested the new Icebreaker-2/LITA drill, on an equal footing with other planetary-prototype drills tested at Drill Hill since 2004. It cumulatively went 3.2m depth over 4 holes… but found that the lightweight, low mass, low-downward-force design did not fare well in frozen breccia, with its deepest hole reached at 90 cm, where it stuck. Previous tested drill prototypes (with 3x the mass and more power) managed 1.5-3m depths under similar conditions at the same site. Given that this new drill was originally designed only for half-meter deep sampling from a mobile platform, it met expectations. And this is a successful test result — even if this drill design didn’t go deeper. It shows us where we are on the (light-weight/low-energy) vs (depth into hard materials) tradeoff here, compared to competing designs and concepts, and this is needed and useful for future drilling mission proposals and planning. Alex Wong from Honeybee Robotics sets up the Icebreaker-2 drill inside a dome tent on Drill Hill. Opportunistically, our team also sank three sniffer-shafts for the GETGAMM project (see last post), two with a commercial rotary-percussive hand drill (to 2m depths) and one with Icebreaker-2 (to 80cm). We drew cuttings and gas samples to carry back to NASA Ames and then to forward to Lisa Pratt and her team at Indiana University. 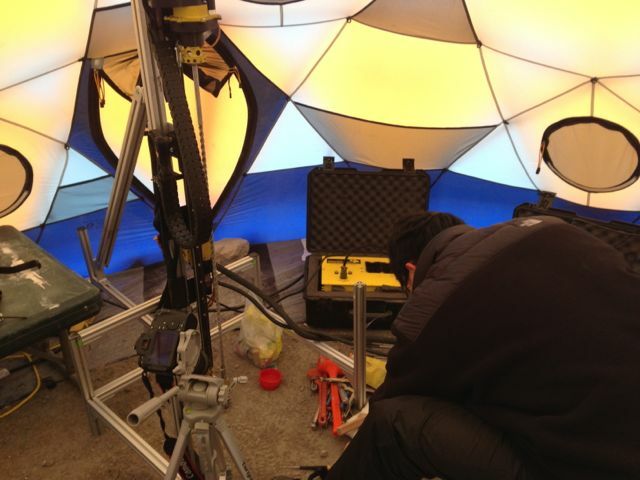 The two 2m-deep monitoring stations remain on Devon Island for future monitoring and sampling. GETGAMM project gas-monitoring drill string, being sunk into the area known as Von Braun Planitia near Haughton Crater. We closed up the Haughton Crater camp on 21 August, packed our equipment in Resolute for shipment back to the USA and NASA Ames, and left the Arctic for Yellowknife and home over this past weekend. 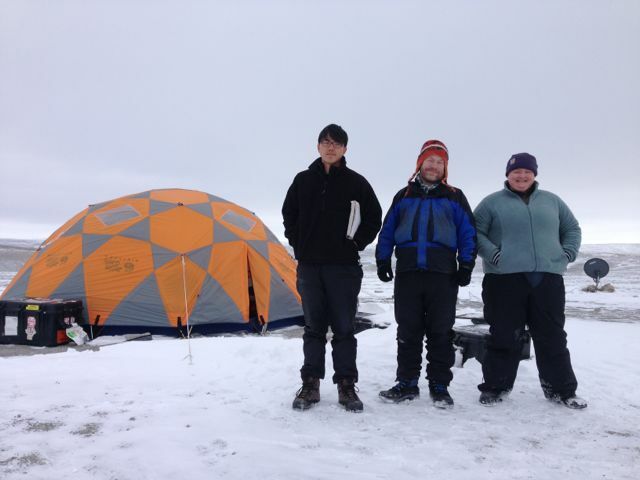 The Icebreaker-2 drill 2013 field test team, outside the Drill Hill dome tent in Haughton Crater: Alex Wang from Honeybee Robotics, and Brian Glass and Sarah Huffman from NASA Ames.